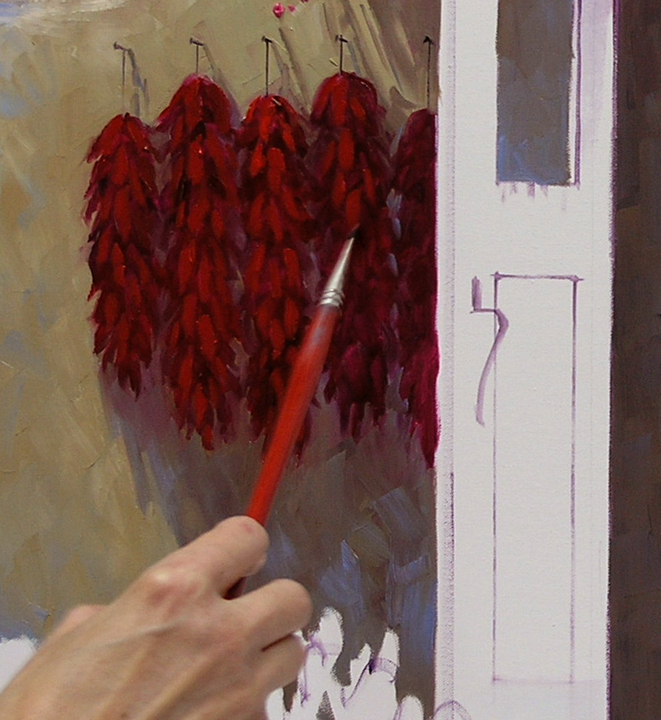 The wash on the chili ristras is dry so I come back in with Cadmium Red Deep to paint the peppers. This step adds texture and form to the individual chilis. Highlights are added with brushstrokes of Cadmium Red Deep + a little White. I love these southwest doors with the willow twigs in the openings. The original doors were old, weathered wood. I decided Blue would be a nice compliment to the colors around them. 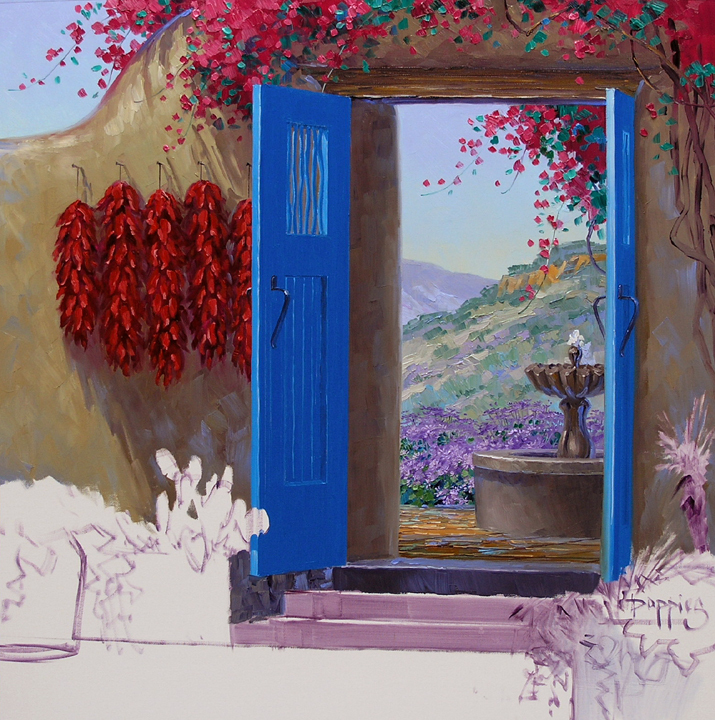 Mixtures of varying proportions of Pthalo Blue + White are used for these. The lights and darks on the terra-cotta floor are painted first. Then the perspective lines of the tile are drawn into the wet paint. So much of our reference material is on slides, taken way before digital cameras became available, and more importantly, affordable. To look at the slides we project them into a rear viewing screen. This allows me to see them in the studio with regular lighting. The image on the screen is a Red Yucca taken in Midland, Texas. We lived there several years ago for six months, meeting some of the friendliest people we’ve ever known. Sales in our gallery in Santa Fe have left some empty spots on my wall. We’ve welcomed a few new Team Senkarik Members and I have more paintings to do. Yippee! So here goes, a new start for Santa Fe. I had a lot of fun painting the cactus and yuccas in Enticing View so I decided to add some to this piece. 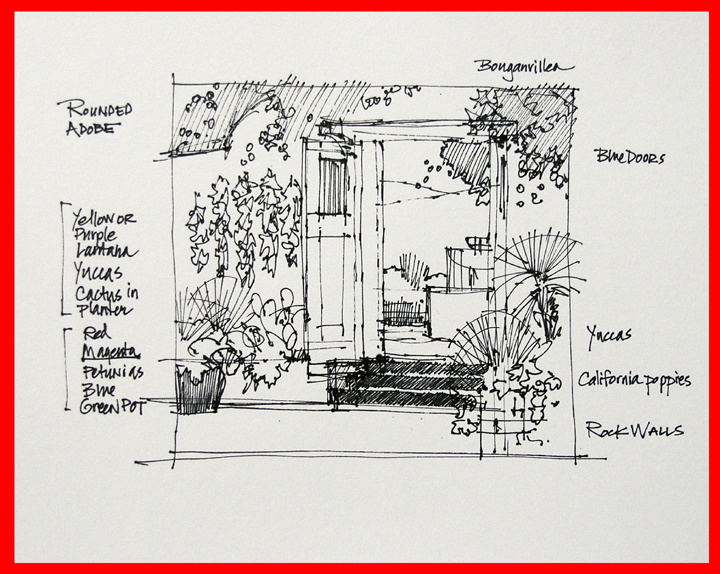 The rough sketch is shown above. 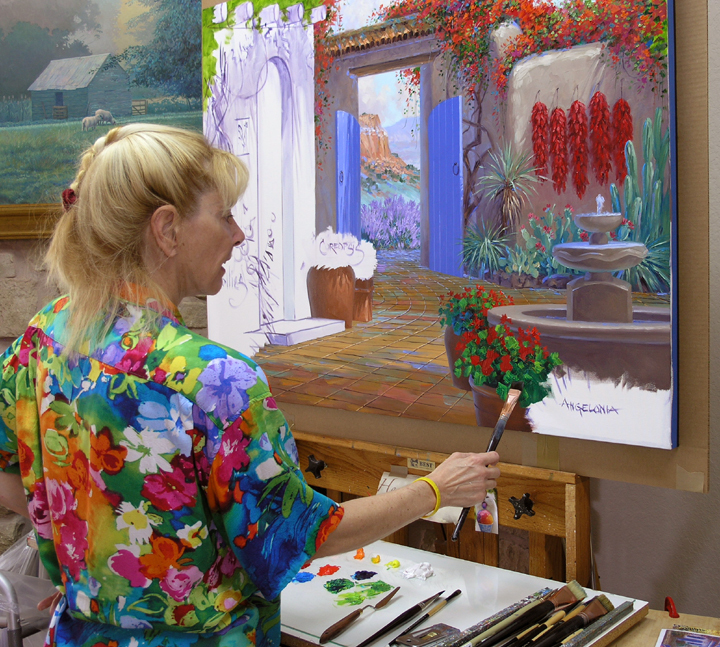 My canvas is 30 inches by 30 inches, a square format fun to work with. The elements are sketched on the fresh white surface with a brush dipped in a wash of MUD (Ultramarine Blue + Alizarin Crimson) + a lot of Liquin. Ultramarine Blue + White is used for the top of the clear blue sky. The lower portion, nearer the horizon, is a mix of Pthalo Blue + White + a tiny touch of Hansa Lemon Yellow. 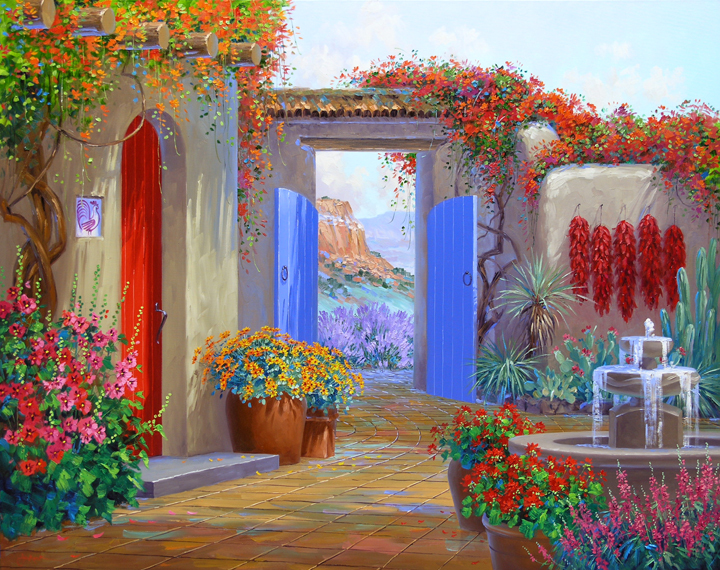 The pinks of the Bougainvillea cascading over the rounded adobe wall are blocked in over the wet sky. This makes it easier to soften edges and draw the long colorful stems. For those of you unfamiliar with Bougainvillea, the actual flower is white and quite tiny. Each cluster of three flowers is surrounded by three to six bracts in the bright colors we associate with this beautiful plant, including pink, magenta, purple, red, orange, white, or yellow. As Jack would say, “Just a little lesson for the day!” The adobe mixtures are worked around the bright bracts of the Bougainvillea. 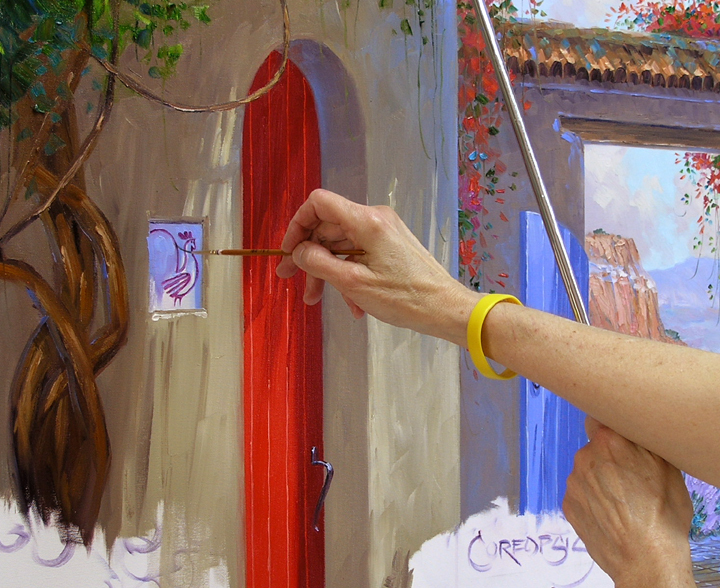 Before finishing the wall the chili ristras are washed on the canvas with a mixture of Alizarin Crimson + Liquin. The adobe wall is then painted around the shapes of the peppers. I let some of the red drag into the adobe color. In nature the red of the ristras would reflect into the shadow, giving the wall a tint of red. I’ve used the color remaining from my previous piece, lined up on the left of the palette, to make the mixes for the landscape. The container on the top left holds the Turpenoid odorless paint thinner we use to clean our brushes. If you have small children or allergies you can use Safflower Oil instead of paint thinner. 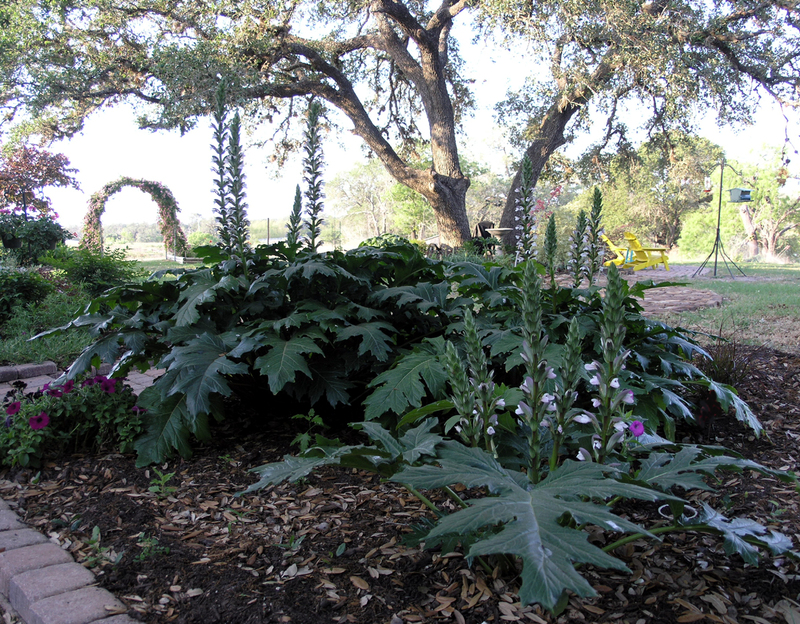 This cool plant is called a Bear’s Breech and is originally native to the Mediterranean. The leaves are believed to have been the design inspiration for the top of Corinthian columns in Greek-Roman architecture. A couple of years ago Jack spotted a few of them stuck away on a back shelf at Home Depot. We’d never heard of a Bear’s Breech but decided to give it a try in our garden. A dear friend calls this a “Bear Claw” and it’s in its glory this time of year. The bloom stalks grow to about five feet tall and our hummingbirds love them. 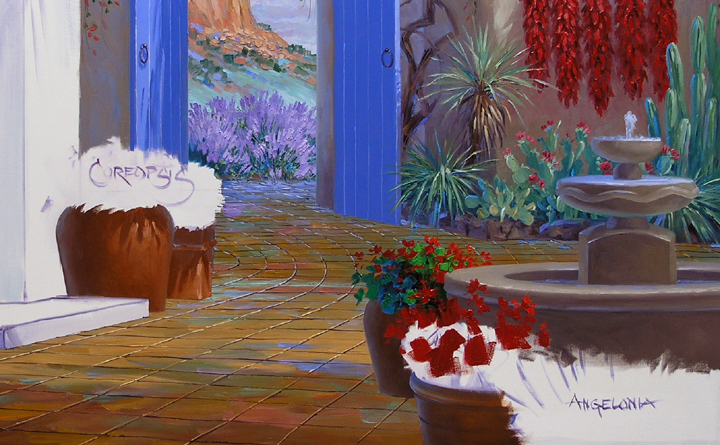 Back to painting, our Taos gallery needs a replacement piece. My initial sketch on the canvas is very simple, just the basic elements and shadow patterns are indicated. The adobe is painted first, followed by the dark areas on the red door. A mix of Cadmium Red Deep + Alizarin Crimson is used for the shadow. 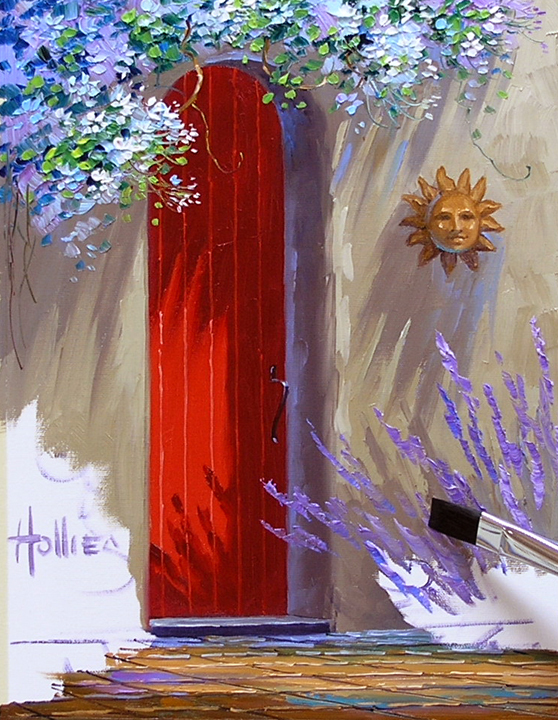 The highlight on the door is Cadmium Red Light. After painting the floor I grab my mahl stick to steady my hand while blocking in the sun face. Color remaining from the terra-cotta floor tile is used for the wall ornament. 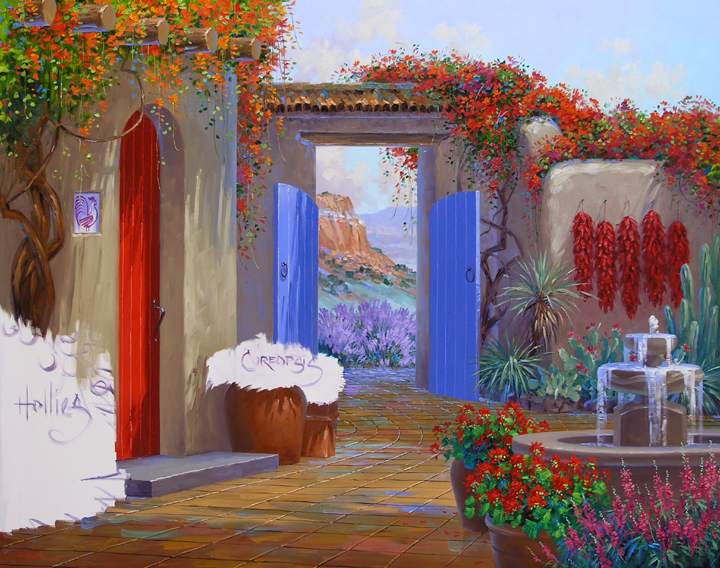 White Spanish Jasmine draping over the door extends a welcoming fragrance to all who enter. 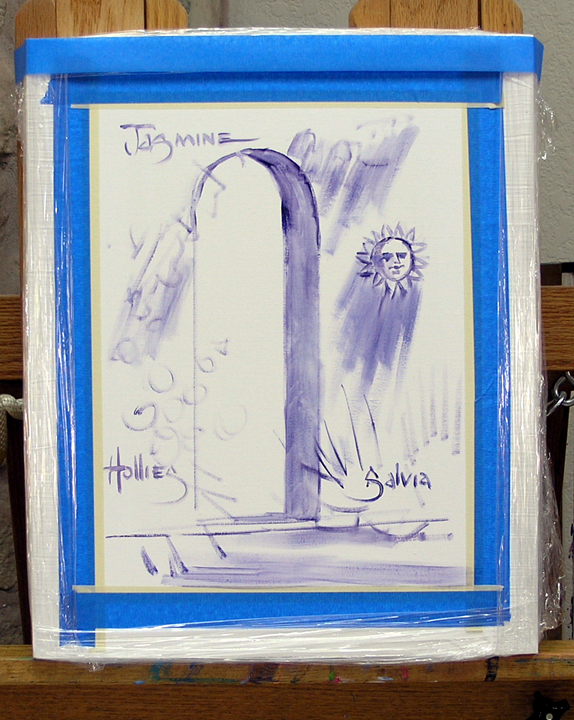 The Salvia is blocked in with several mixes of Dioxazine Purple + Ultramarine Blue + White. 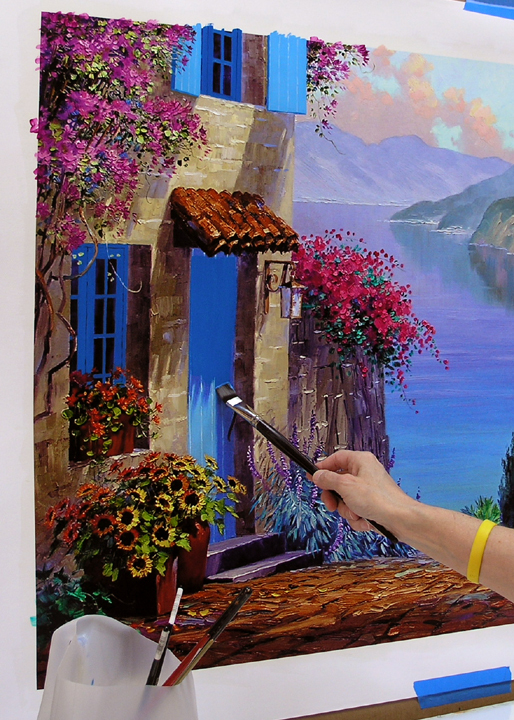 The flowers are painted first, then the foliage is worked around the purples. 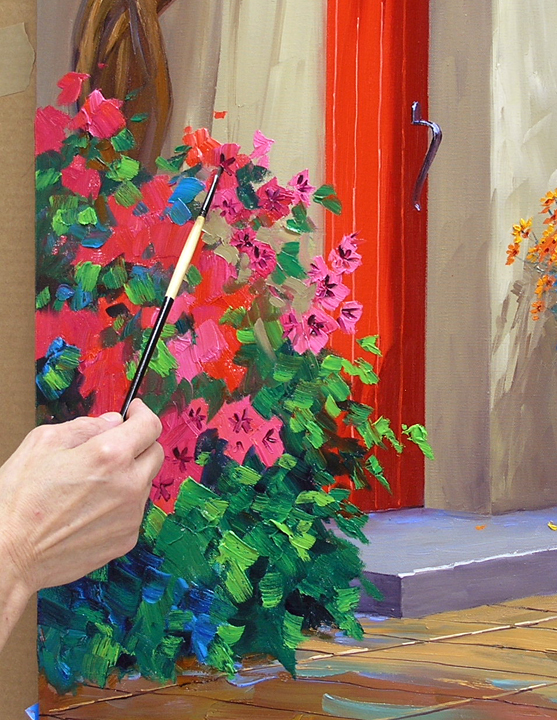 Working in this sequence allows the color of the blossoms to remain crisp and clean. Had I painted the greens of the foliage first, the flowers would have become muddy. 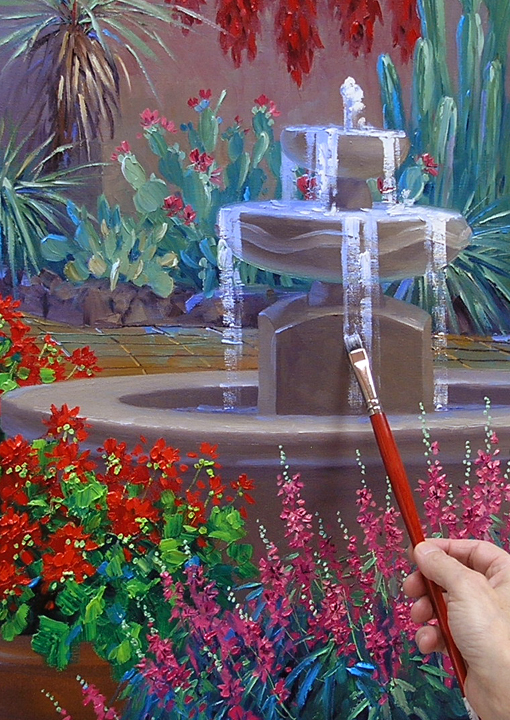 Hollyhocks brighten the lower left corner of the painting. 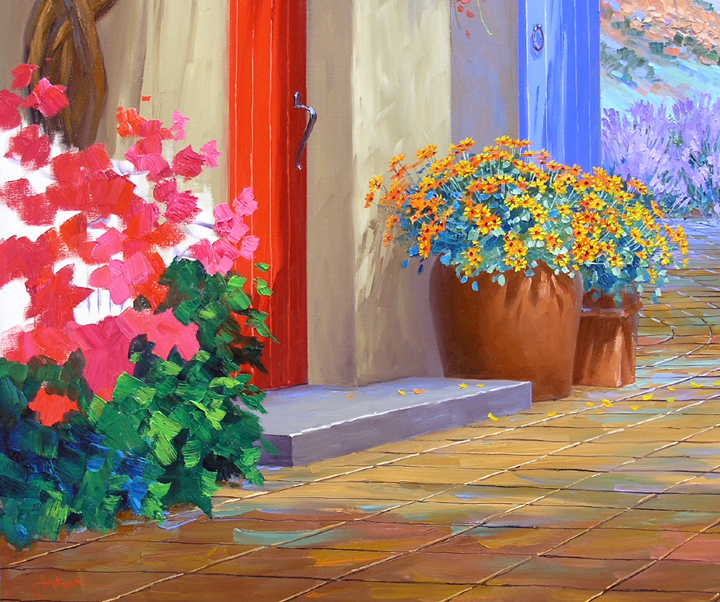 Their blossoms are different mixtures of Permanent Rose + Cadmium Orange + White. 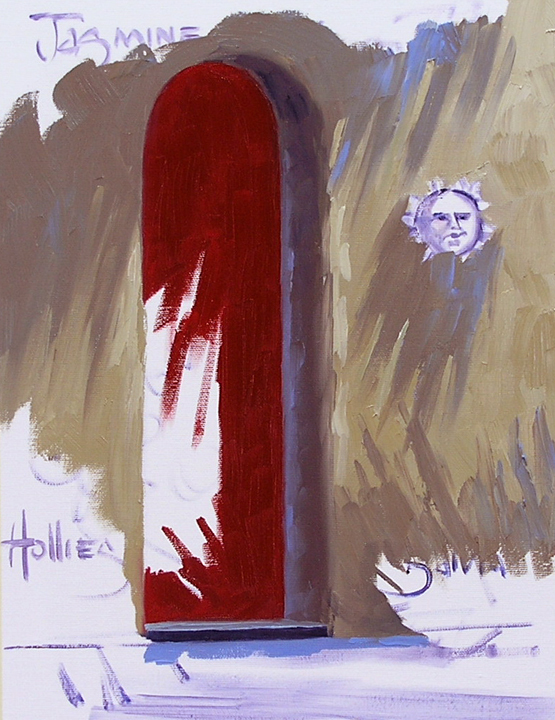 The dark foliage of the Hollyhocks acts to stop the light coming into the painting from the right. The viewer’s eye follows the stalks up to the White Spanish Jasmine. 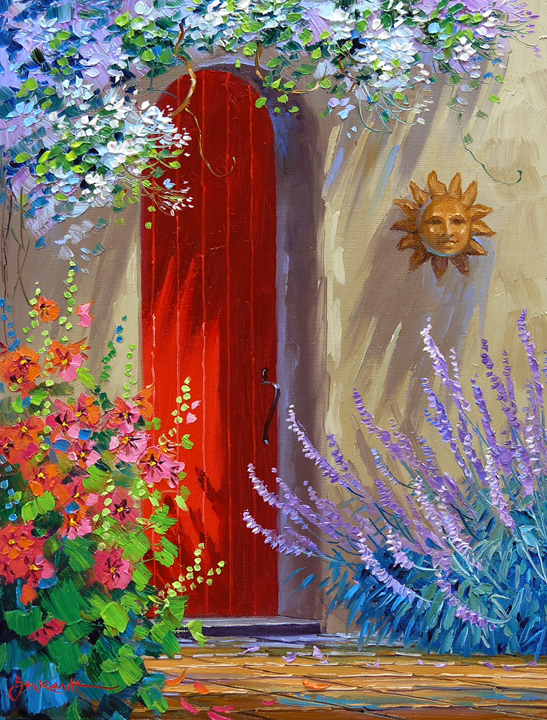 The tendrils of the vine then direct the gaze over the arch of the red door to the Southwest Sun on the wall. Jack has had another article published by Fine Art Studio Online. To read 12 Steps to Failure just CLICK HERE. This time of year is so fun. Hummingbirds migrate through south Texas and are starting to appear. The four feeders placed around our back patio are buzzing with activity. I have to be careful in the mornings, they fly by so fast I’m afraid they’ll take my head off! 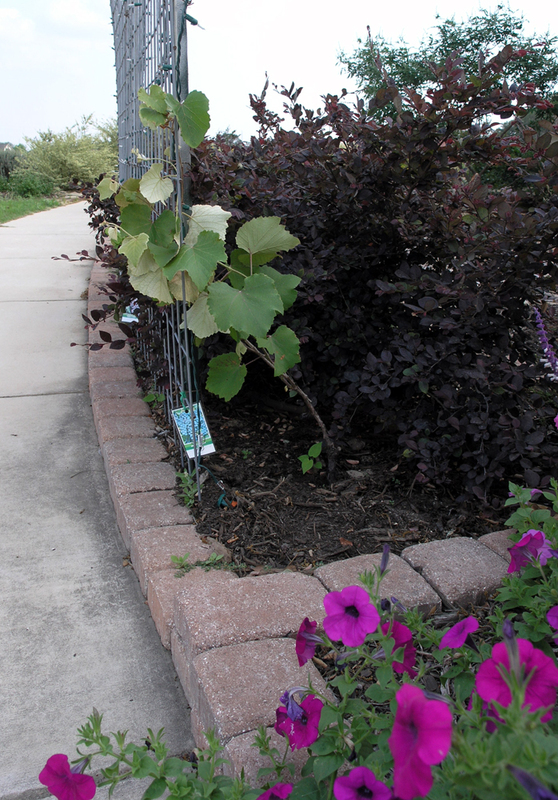 Our grape vines are growing and beginning to work their way up the grape arbor. It’s made of 2 twenty-foot lengths of bull fence, arched over the front walk to the studio and anchored to steel posts. CLICK HERE to learn more about our “Tunnel of Light”. Six vines will give us a variety of red and white grapes this summer. 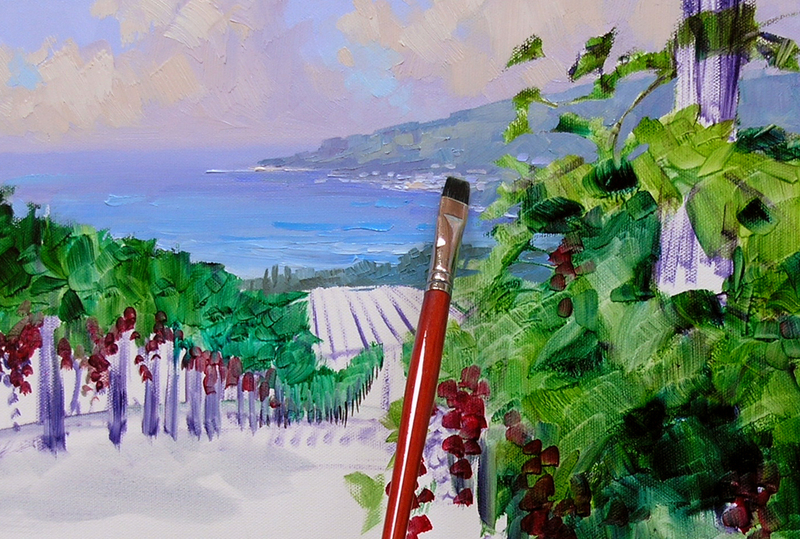 Dreaming of our Senkarik White appellation makes me want to paint a vineyard. 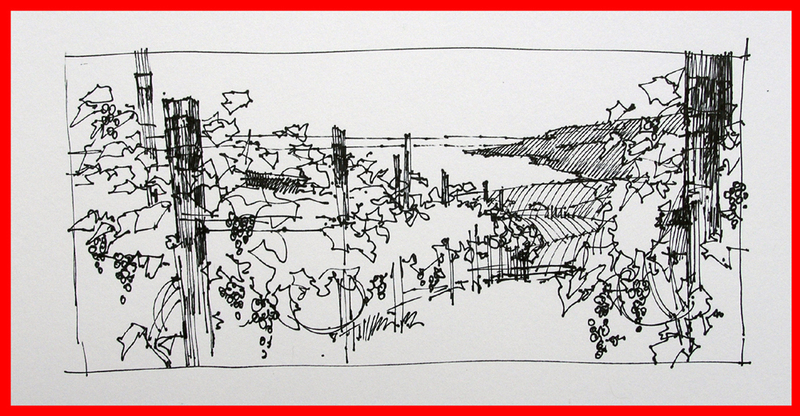 My sketch is from Provence in the south of France. The hills surrounding the tiny seaside village of Cassis are covered in vineyards. What great memories this brings. 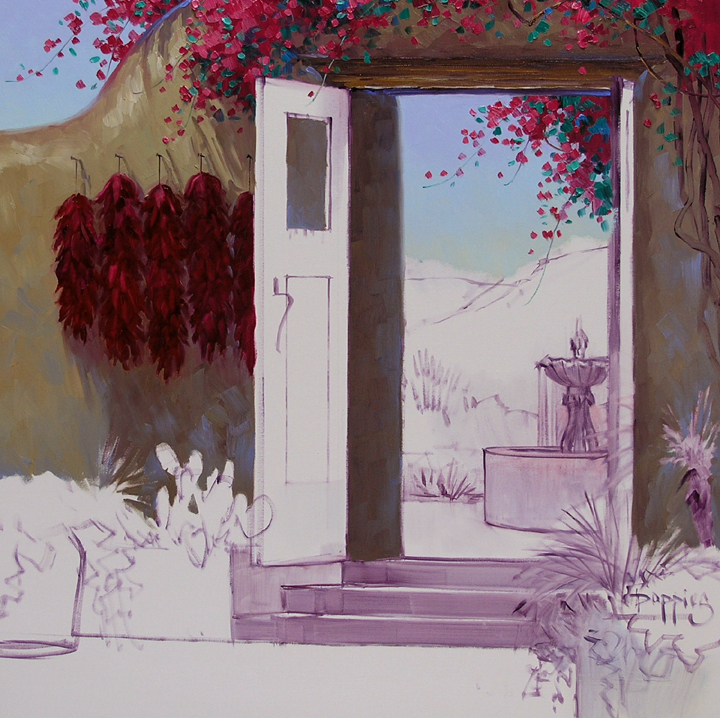 When we visited Provence an artist Jack was helping via the internet met us. Pixie was a delightful tour guide, driving us through the beautiful countryside. Since she lived in Aix-en-Provence and is an artist herself she knew all the perfect spots to take us. Cassis was my favorite. The basic elements are drawn on the canvas with a brush dipped in a thin wash of MUD (Ultramarine Blue + Alizarin Crimson) + Liquin. 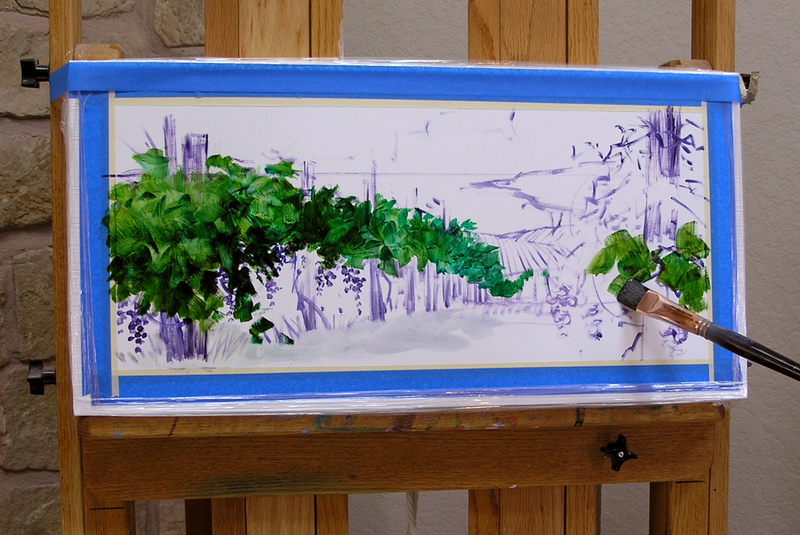 The vines are washed in with a mix of Ultramarine Blue + Cadmium Yellow Medium + a lot of Liquin. 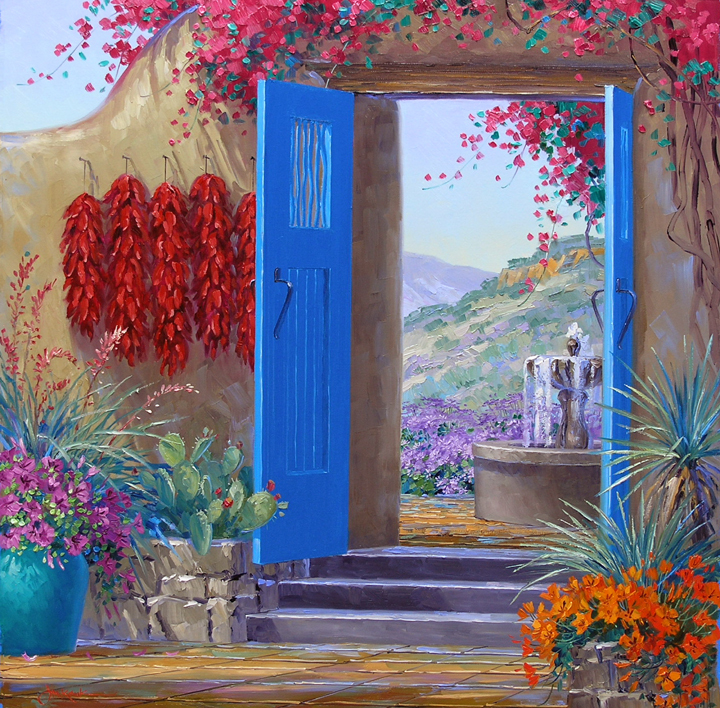 Pthalo Blue is added to cool the vines as they descend down the hill. This helps me to visualize their placement on the canvas. In the morning the wash on the vines will be dry. I’ll be able to paint the sky and ocean without fear of muddying the color. On a lazy summer day the horizon line of the Mediterranean Sea fades into the soft, fluffy clouds. A mix of MUD (Ultramarine Blue + Alizarin Crimson) + Ultramarine Blue + White makes a dull blue for the water along the horizon. As the water comes closer mixes of Pthalo Blue + White are used. The mountain is various mixtures of Ultramarine Blue + Cadmium Orange + White and MUD + White. Some of the paint left over from the clouds is used for the beach and village of Cassis. All of the colors are kept very soft in order to make the village stay way back in the distance. The vineyards cascading over the hillsides are fun to do. 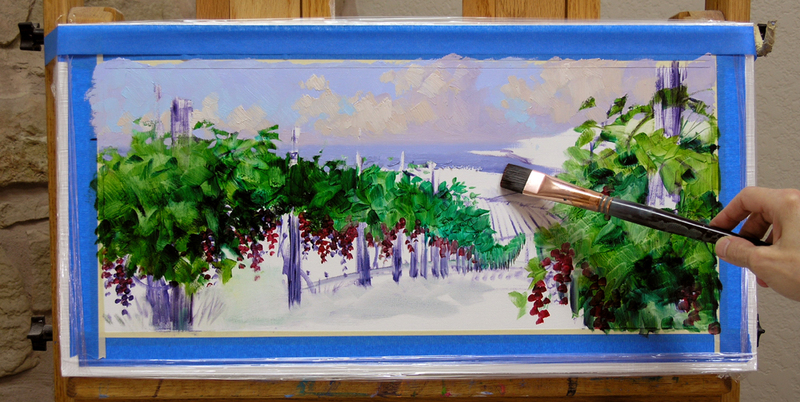 The fields of cool greens are painted first with the most distant vineyard cooler and lighter. Then the lines of the rows are drawn into the wet paint. The joy of being an artist is we can make the world on our canvas as we want it to be. 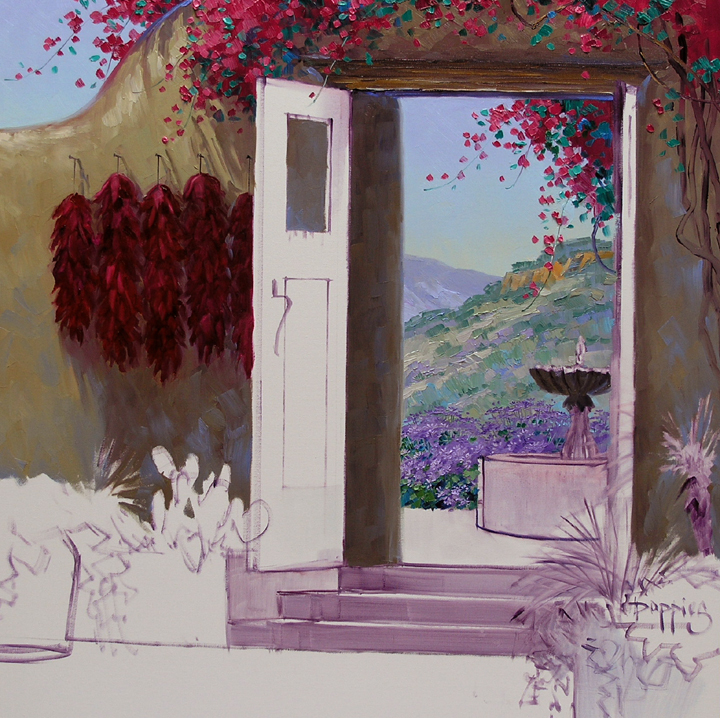 Even though this is a summertime piece I’m adding Poppies that cover the hillsides of Provence in the spring. The grass in the front vineyard is made warmer with mixes of Pthalo Blue + Cadmium Orange + Cadmium Yellow Medium + White. 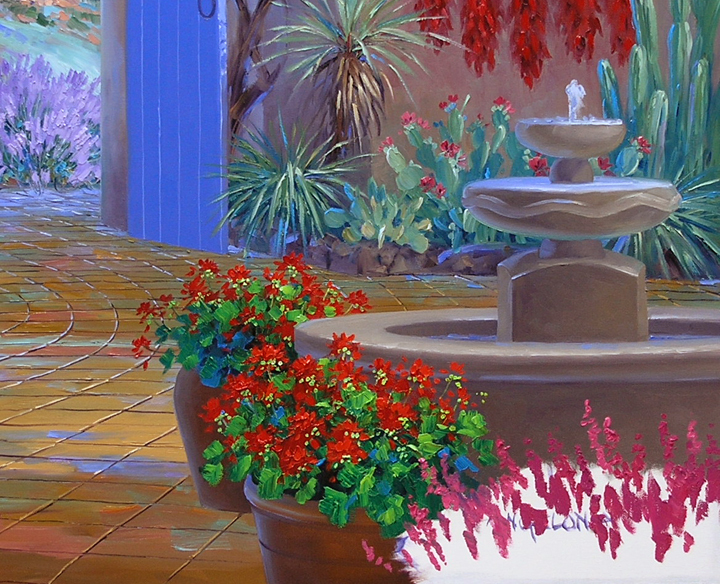 The vines are painted with various combinations of Ultramarine Blue + Hansa Lemon Yellow. 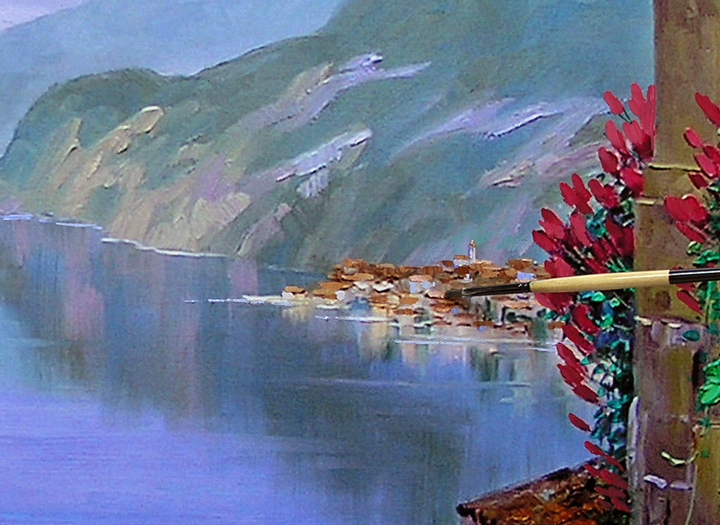 Brushstrokes of Pthalo Blue + White are added in the shadow side. As the vines go down the hill they are made lighter and more blue. Grapes, ready for harvest, complete Cassis Vineyards. 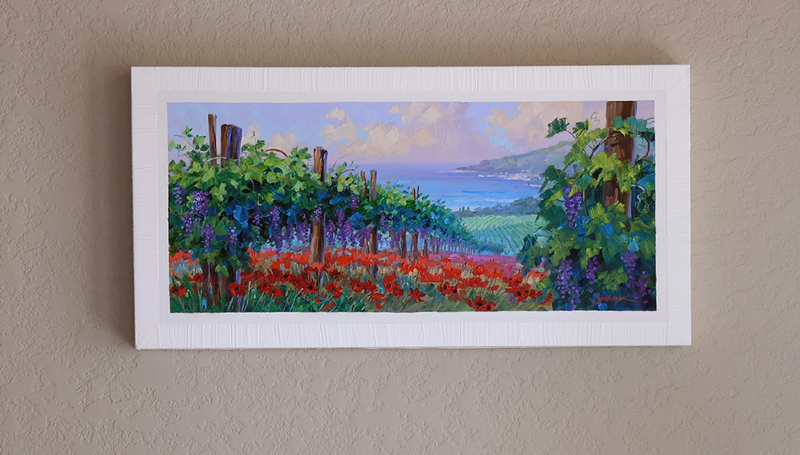 Cassis Vineyards is available for sale on my eBay auction. 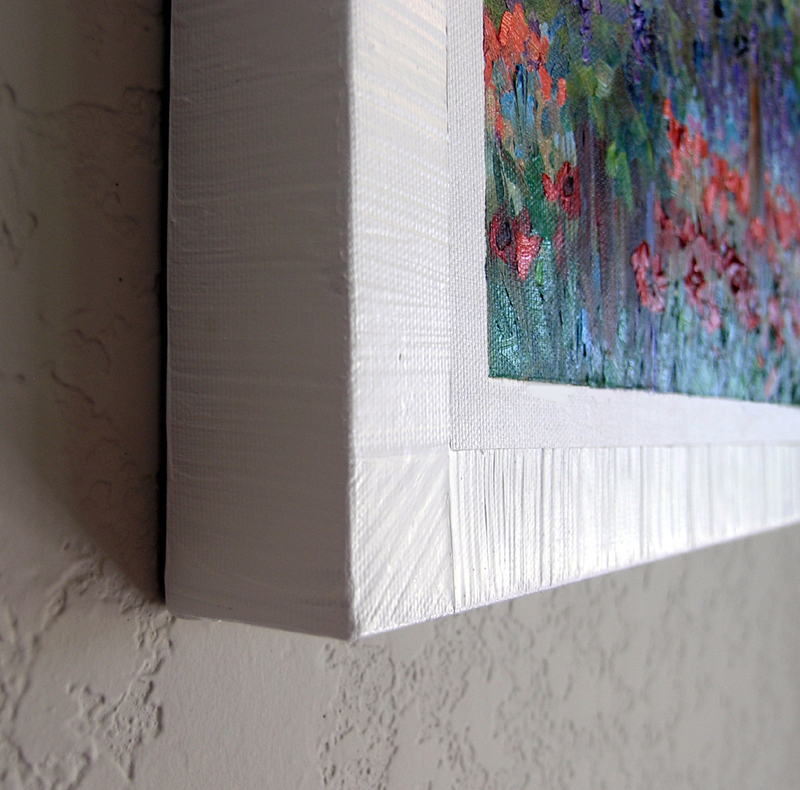 Framed in our White Senkarik signature frame the outside dimension is 12 inches tall by 24 inches long. The painted image measures 9 inches tall by 20 1/2 inches long. A painting this size retails in our galleries for $750. The starting bid is 1 penny. That’s right, only 1 cent! Click Here to go to my eBay auction. 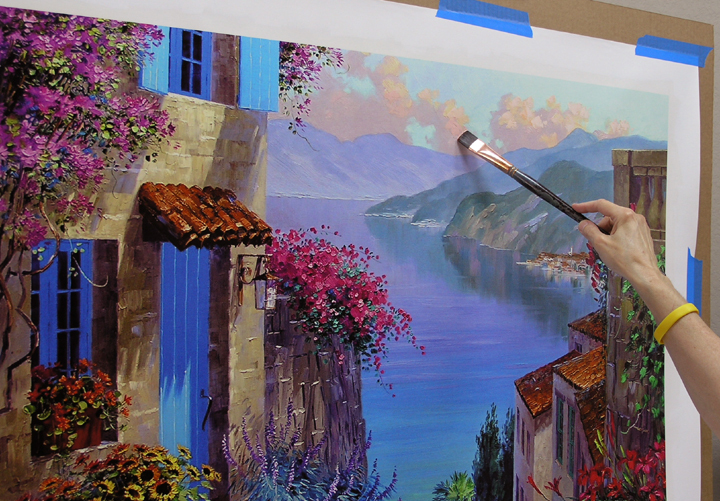 I’m embellishing a Giclee today for one of our Team Senkarik Members to hang in the entry of their home. 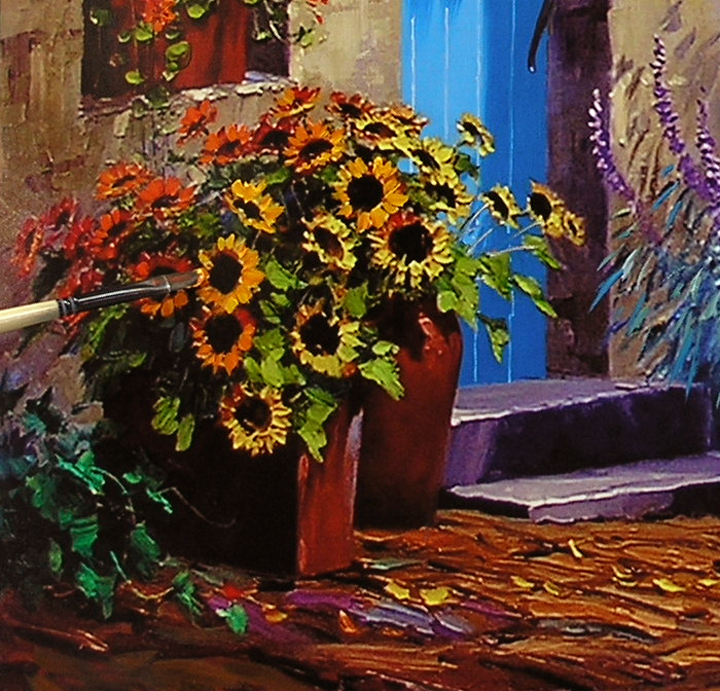 For those of you not familiar with them, a Giclee is a digital reproduction of one of my original oil paintings. I go back in and paint, or embellish, the Giclees printed on canvas. 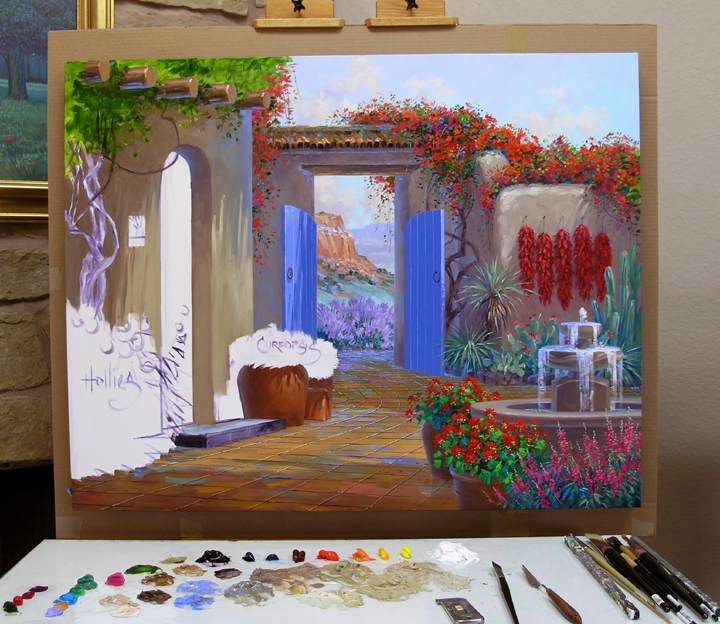 Instead of our regular oil paints I use Alkyd Oils for this process. Similar to oil paint but they dry much, much faster so I can apply a lot of texture. Each piece is part of an edition; however, no two are embellished in exactly the same way so they are original. Hence the term, Limited Original. 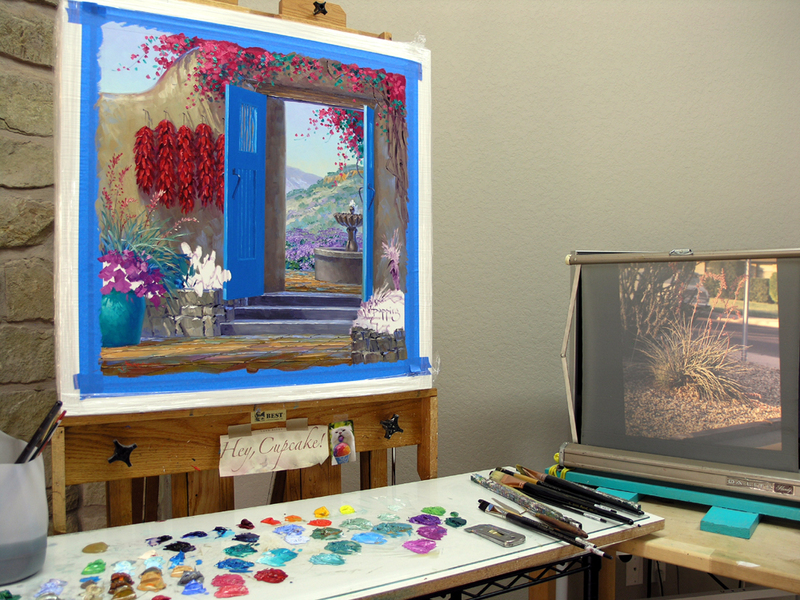 Some paint from the previous painting is saved on the left side of my easel just in case I need the colors. I’ll add Liquin to them if used on the Giclee. 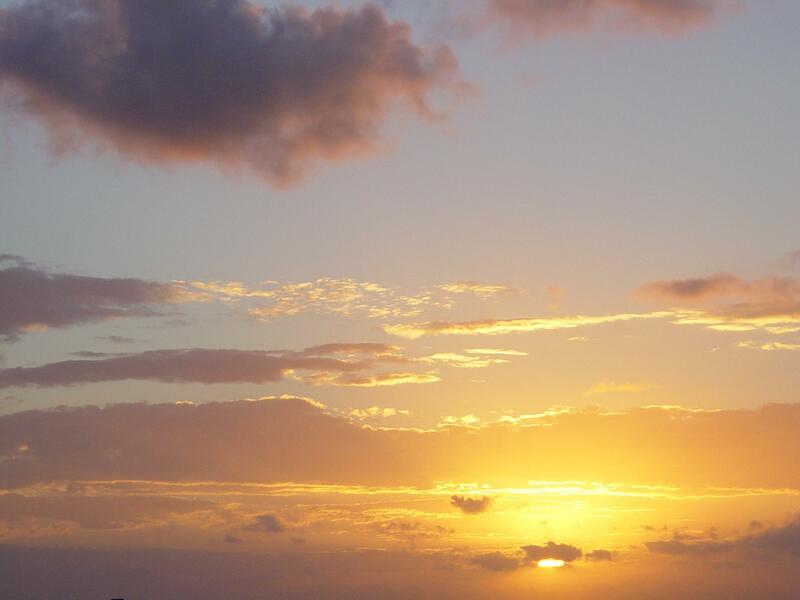 The highlights on the clouds are enhanced, accentuating the warm glow of the sun. I also glaze the distant mountains with Ultramarine Blue + a lot of Liquin. Next the windows, shutters and door are repainted with a mixture of Pthalo Blue + White. 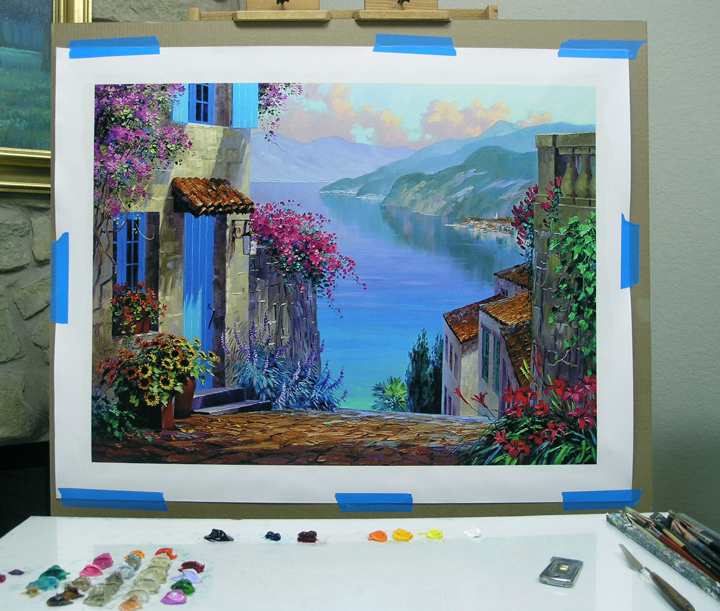 More blue is used in the mix for the shadows; more white for the lighter, sunlit parts. 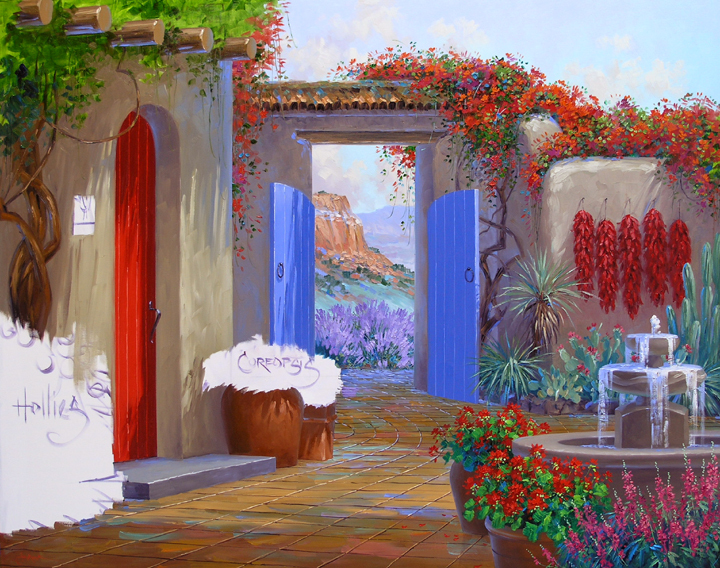 I always repaint the doors and windows on the Limited Originals because they are a little dull when we receive the reproduction from the printer. 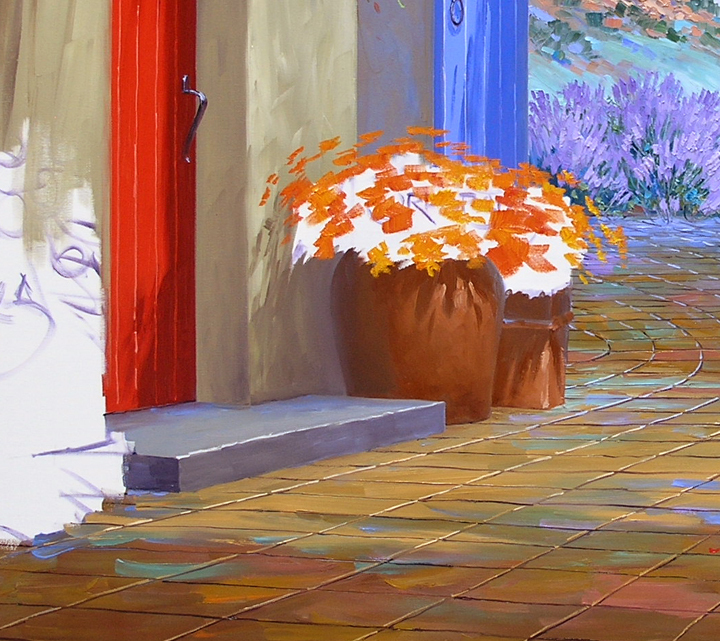 This gives a pure, crisp POP of color and makes them look like the original painting. 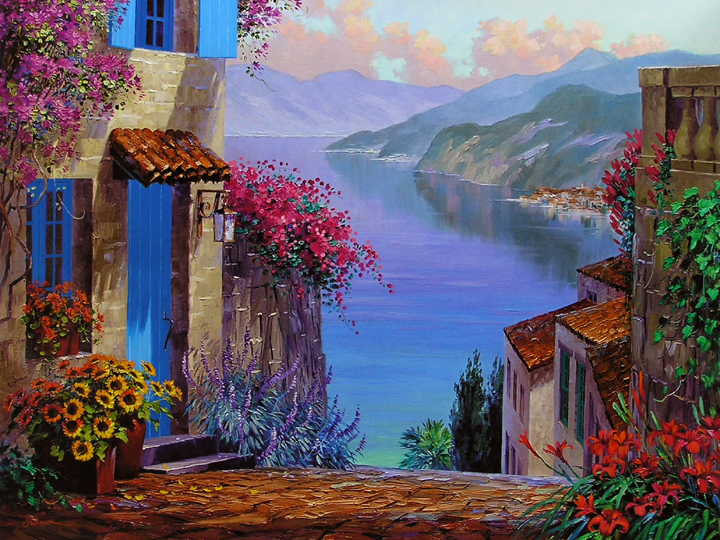 The rooftops and tower of the distant village that reflects down into Lake Como are also enhanced. The yellow petals of the Sunflowers are repainted with mixes of Cadmium Orange + Cadmium Yellow and Cadmium Yellow + Hansa Lemon Yellow. Using alkyds allows me to paint thickly with lots of texture. Coreopsis are a treat to paint. The yellows and oranges of the blossoms are blocked in first. The complimentary purple color of the Sage behind the yellow Coreopsis makes them glow. To see any of these pictures larger just click on the image. The foliage of the Coreopsis is various mixes of Pthalo Blue + Orange + White. More White + a touch of Hansa Lemon Yellow is added for the highlights of the leaves and the stems. 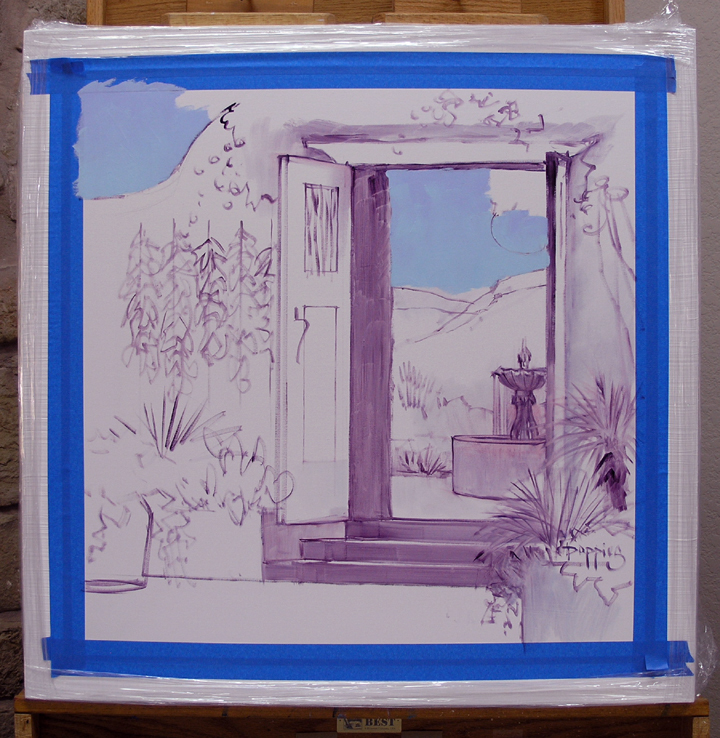 On the shadow side a few strokes of Pthalo Blue + White are made to add coolness and round the foliage. The centers are made with Alizarin Crimson + Liquin. 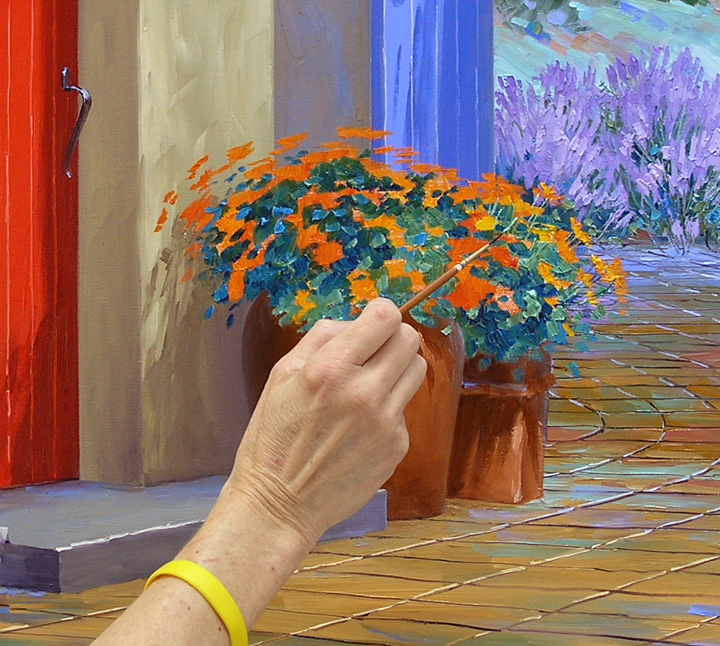 The mixture for the highlights on the happy yellow flowers is Cadmium Yellow Medium + Hansa Lemon Yellow + a bit of White. The corner of a 1/2 inch bright brush is used to pop them in. Now for the icing on the cake, the Hollyhocks! As with the other flowers the pink blossoms are painted first. Permanent Rose is pulled out again, then a little Cadmium Red Light is mixed in to make a warm pink. Bright green leaves of Pthalo Blue + Hansa Lemon Yellow are painted around the spots of pink. After completing the foliage I go back in, indicating the centers of the individual blossoms. The same mix used for the centers of the Coreopsis works here. Working on a glass palette has several advantages. We place 1/4 inch glass on a white shelf board. Since we paint on white canvas it is only logical to mix our color on white. The glass makes clean up a breeze using a single edge razor blade in a paint scraper. The glass palette also comes in handy in planning a stylized design. 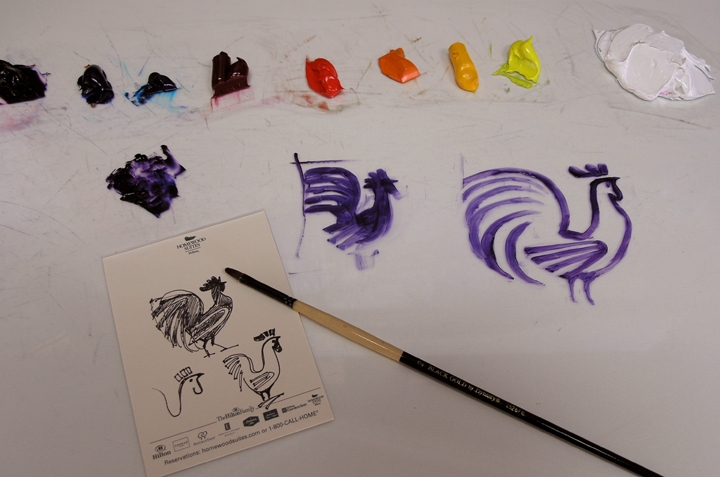 I made a few thumbnail sketches of a stylized rooster design for the tile by the door on a note pad. With MUD (Ultramarine Blue + Alizarin Crimson) + Liquin I begin drawing my idea on the palette with a brush dipped in the wash. The design on the left isn’t working so I begin another drawing on the right. It’s easy to make changes and corrections on the slick glass. Using a brush dipped in paint thinner, then wiping it clean with tissue you can go in and erase a line. I do like this little rooster on the right! Because the building with the tile is at an angle the rooster design will have to be foreshortened. Bracing my arm on a mahl stick for stability the design is drawn on the tile. CLICK HERE to find out what a mahl stick is. The little rooster is ready to happily crow, welcoming guests! 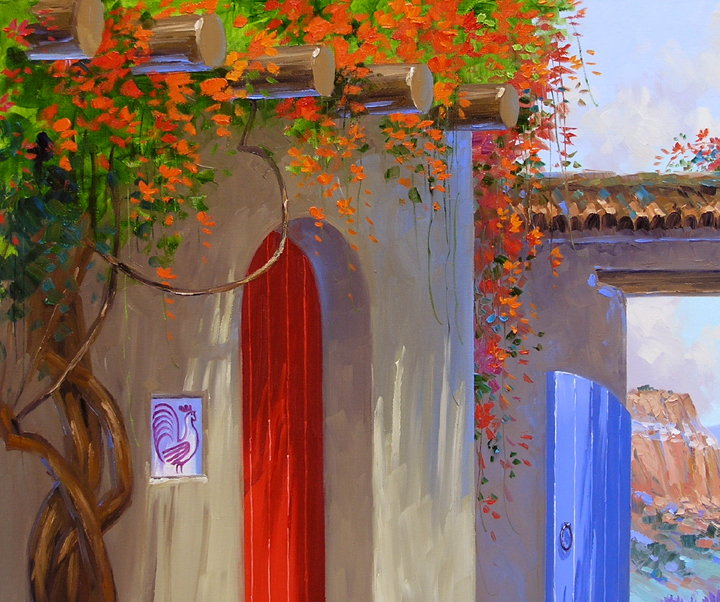 Attention is now directed to the Trumpet Vine draping over the ancient adobe. Jack is feeling so much better. It’s amazing, you don’t realize how good you feel until you get really sick. We even decided to quit early today to take a drive through the countryside, just enjoying each other’s company. Thank you to all who have asked. Anyone who has opened their heart to a pet from a shelter usually finds out some traits they weren’t expecting. Well, we’ve discovered some interesting things about our new adopted kitties. Sissie loves grass. 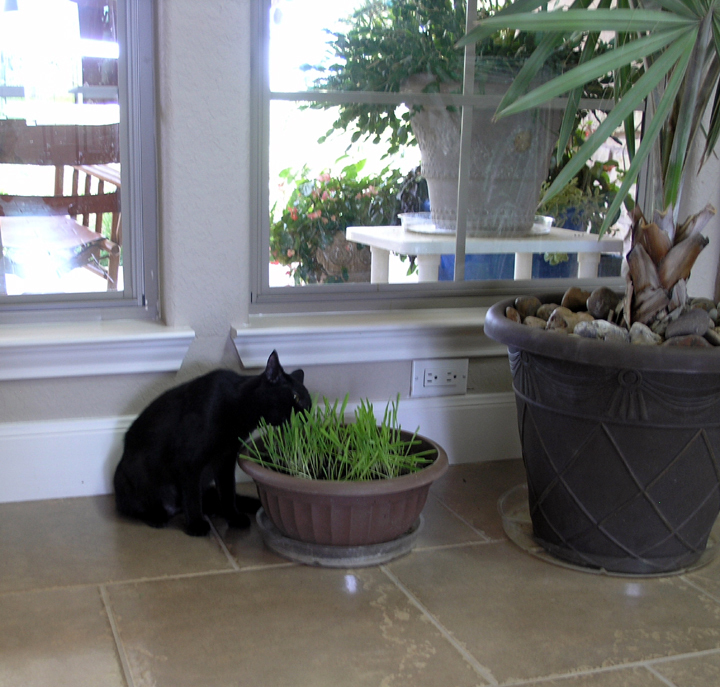 Cat grass, that is. Sissie growls and chases Molly away if she comes anywhere near the planter the barley grass is in. 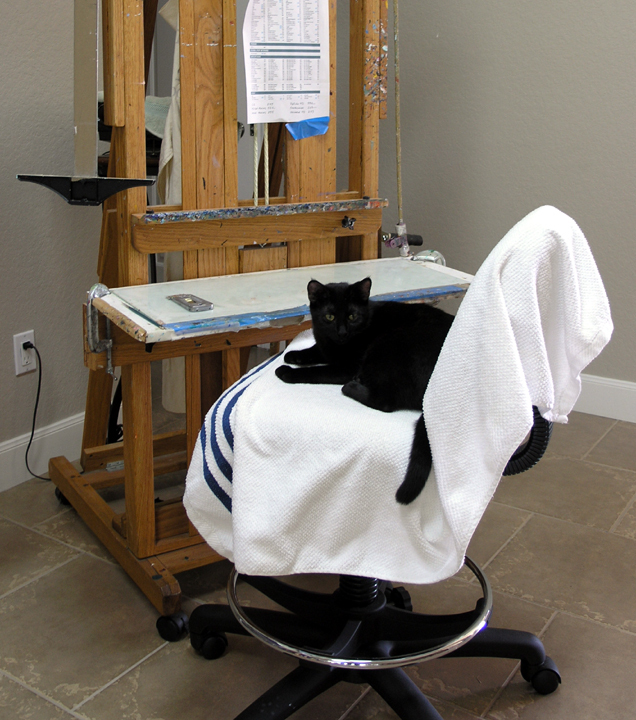 So in return Molly has taken over Jack’s easel. I guess she decided it would be fun to be an artist! One thing for sure she has become a garden cat extraordinaire who loves to climb trees. And I mean BIG TREES. I couldn’t find her this morning when it was time to come in, so I called. I heard a tiny meow about twenty-five feet above my head. There was Molly in the top of one of our giant Live Oaks. She worked her way down, then climbed into my arms. I think she even scared herself. Today it’s time to work on the foreground building. 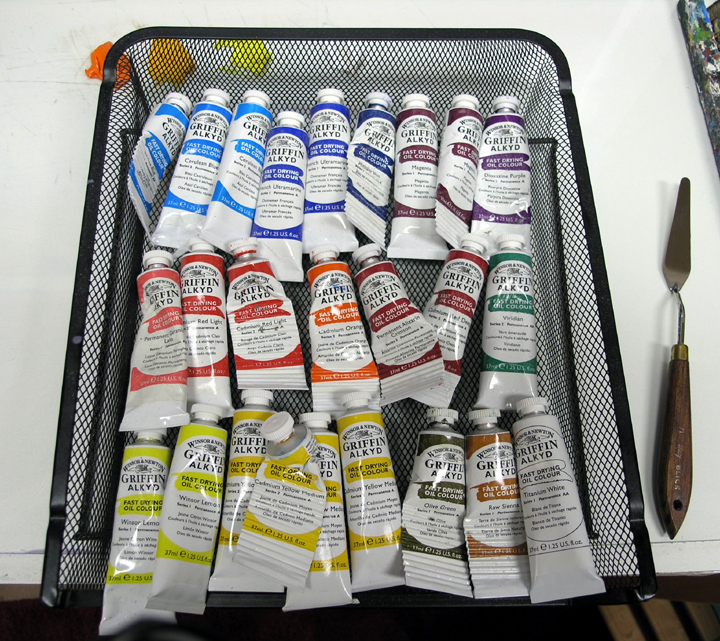 The adobe mixes are laid out on my palette. All are made of varying combinations of MUD (Ultramarine Blue + Alizarin Crimson) + Orange + a tiny touch of Pthalo Blue + White. 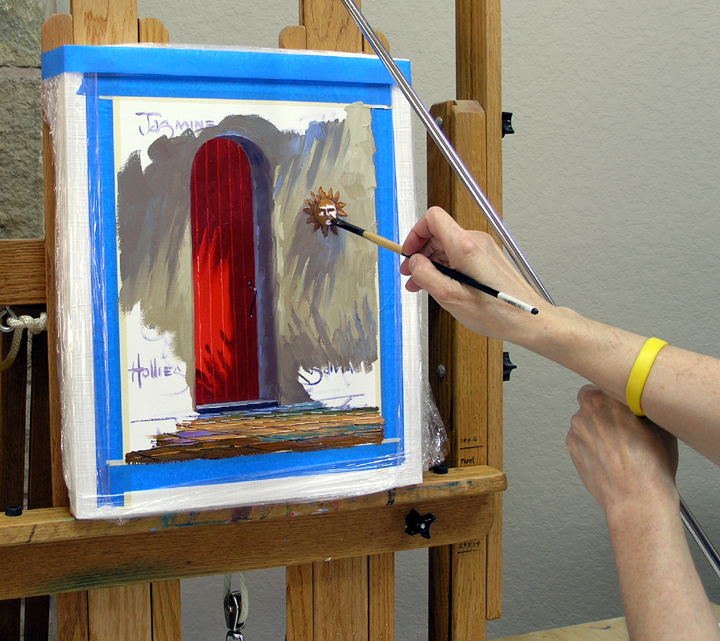 The Pthalo Blue adds an imperceptible green cast to the adobe which will enhance the red of the door. To find out more about mixing colors with our Double Primary Palette CLICK HERE. The shadows are painted first, then the light areas of the adobe. As the wall goes back more Ultramarine Blue is added to the mixture. The coolness of the blue makes the far edge of the building recede. The undulating truck of the Trumpet Vine adds interest to the foreground. The dark upright serves to stop the light coming into the painting from the right. Before I get started today I just want to thank all of you for your concern and support. Other than being a bit wobbly kneed Jack is doing well and is on the mend. He got another great night’s rest and is pretty much back to his usual routine. I can’t begin to tell you how much all of your wonderful comments, emails and prayers mean to both of us. Something like this makes one feel very vulnerable, it’s nice to know you are there. As we say in Texas, “Much Obliged”. Feels good to be back at the easel. Starting on the Geraniums the red flowers are blocked in first as you can see in the picture at the top of this post. Next the green leaves are painted around the blossom color so it remains clean and bright. After adding stems and buds to the Geraniums I move to the Angelonia. The pinks are a color reserved for special occasions, Permanent Rose. 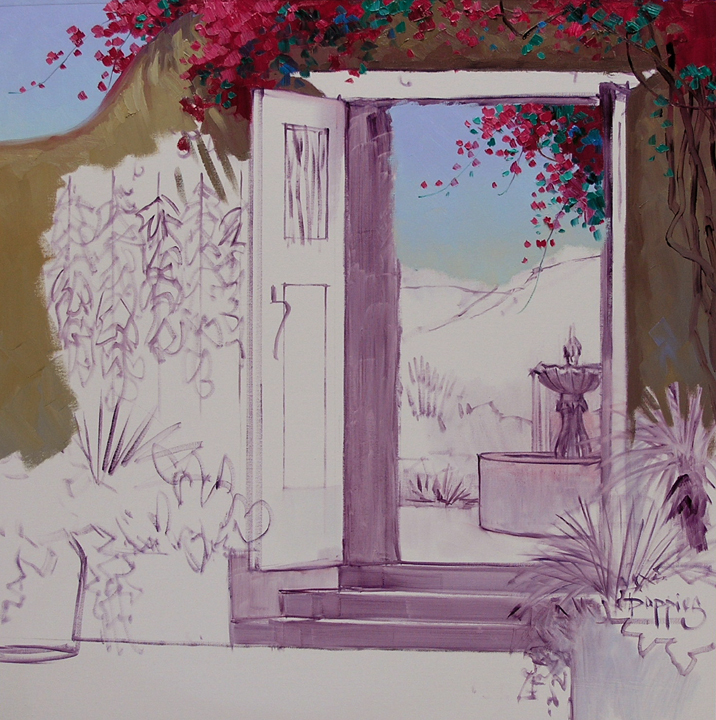 For the flowers in shadow a little Magenta is added. The foliage of the Angelonia is painted with some of the color leftover from the yuccas along the back wall. I just added some Hansa Lemon Yellow to make it a little warmer. 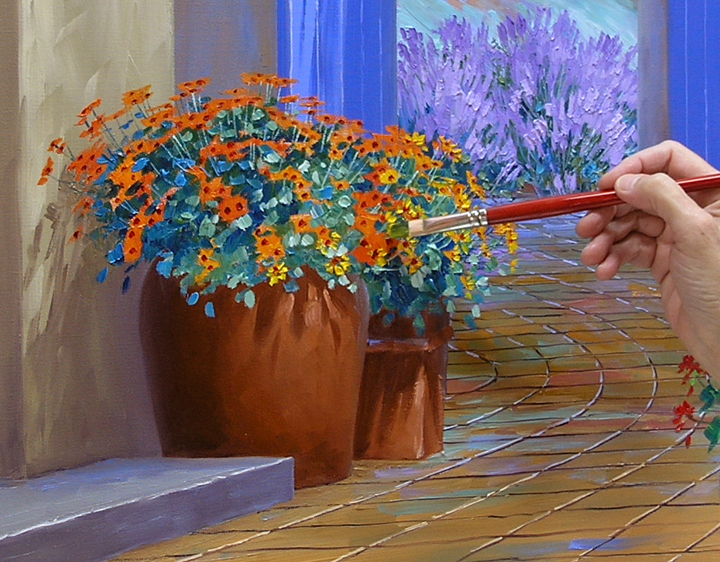 Strokes of Pthalo Blue + White are added for variety in the leaves. The fountain is now dry enough to add the water splashing from the tiers. White + a bit of Ultramarine Blue is lightly dragged straight down, letting the little skips and bumps remain. This gives the appearance of the water flowing down. On the right side, where the light is coming from, pure White highlights are added.